A Wedding, a Company Party, Birthday, Graduation, Wine Night with the girls? Let us provide you the opportunity to make the event a hit, with memories that you can take with you forever. We are a mobile photo & video booth company that offers more than anyone else in Hampton Roads. Unlimited photo prints, unlimited videos, the most expansive prop selection in town, social media uploads, professionally designed and customized scrapbook and thumb drives, your choice of an open air, closed curtain booth or the most gorgeous professionally designed modern booths. You will be calling us soon after the event to thank us and book again! Come see why we were voted The Best of Hampton Roads! Most couples planning for a wedding hire a photographer to capture all the key moments, key moments being the important terms here. Unlike your standard event photographer, Closed Curtain, LLC provides a behind-the-scenes look into the moments the bride and groom are too busy to see. Looking back in your customized wedding scrapbook, provided to you after your event, and seeing your Grandmother dressed in silly props, laughing hysterically, as the camera snaps, gives you a forever cherished memory. 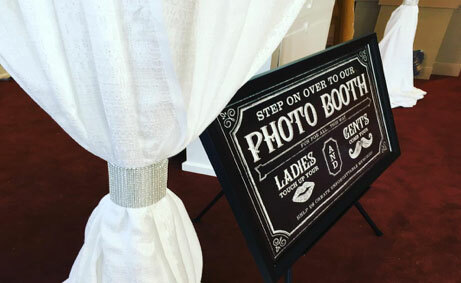 This memory is only going to be captured if Closed Curtain, LLC is present at your event. So don’t delay, book Closed Curtain, LLC for your wedding today. Call 757-343-5396 and ask us how Closed Curtain, LLC can build these lasting memories just for you.